First you need to slice the sweet potato, lengthwise, about a 1/8 of an inch thick. Lightly spray pan with olive oil (or canola oil). Spread sweet potato strips over pan and lightly spray again. Add pepper. Place in the oven for 30 minutes (or until crispy) at 400 degrees. Next, quarter the zucchini and cut into pieces about 1/2 of an inch thick. Cut 1/2 on an onion into strips and dice the tomato. Heat 1 tbsp. olive oil over medium-high heat and sautee the zucchini and onions for 4 minutes or until they are cooked halfway through. Empty into bowl. 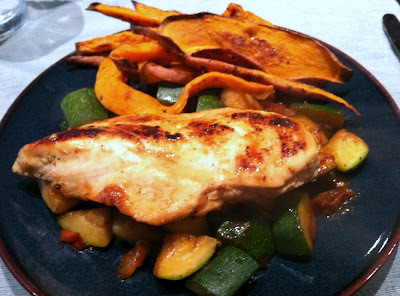 Place the peppered chicken breast in pan and cook for 5 minutes then flip. Add the zucchini, onions, and now tomato into the pan. Cook until chicken is white through the middle (165 degrees). Serve chicken over the vegetables with your sweet potato chips on the side. Mmmm...good enough to eat! Enjoy! 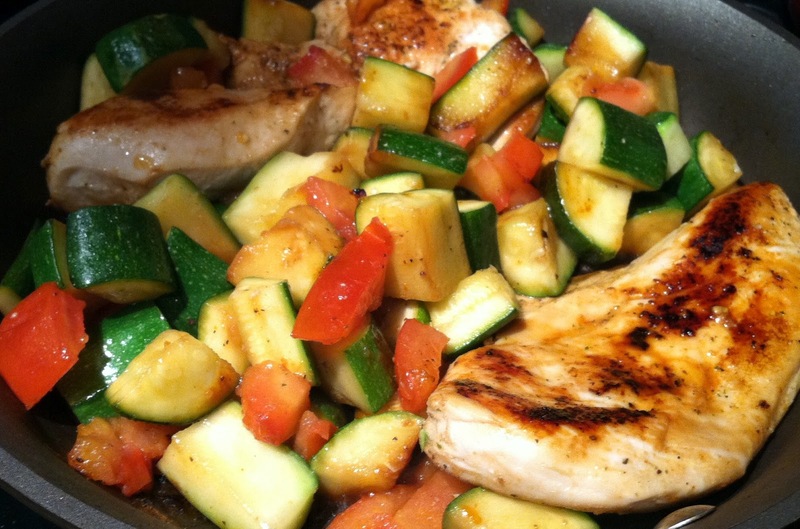 What other healthy chicken and vegetable recipes do you enjoy?